Capabilities Of Different Draw Weights - What Can You Do? A question I get asked often is what you can do with a recurve bow with a specific draw weight. It’s a very valid question, and I can understand how someone who’s never used a recurve in his life might have troubles understanding what a 25# can do in comparison to say a 45# bow. Please keep in mind that everything written here is based on my experience with recurve bows exclusively, and that this information will likely not apply to, say, a compound bow – although the difference should not be huge. What Can You Do With 25# to 30# Recurve? Contrary to what most people think, a 30 or even a 25 lbs. draw weight is more than enough for recreational target practice. If you have the aim for it and your form is on point, you can successfully hit a target from 60 or even 70 yards away with this kind of draw weight. Again, this will depend on your skills – the bow itself will never do any of the work for you (although some designs are more forgiving, such as the Martin Saber or the Samick Sage, to name a few cheaper ones). This is particularly good info for youth as well as small-frame females, who often have trouble with anything higher than a 30 lbs draw weight – they’ll be able to enjoy the recreational side of the sport without much limitations. It’s important however to keep in mind that the majority of high quality recurve bows will usually be available with a #30 minimum draw weight. And to be honest I’m not exactly sure why this is the case, though I can guess that most people are simply more excited about owning a “powerful” bow, so there isn’t as much of a market for the lower poundages. 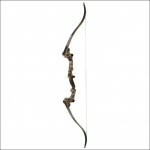 PSE Razor Back and Martin Archery X200 – you can find out about both through my comparison chart. The bottom line is: as long as you are only looking to do some target practice and do not plan to do any hunting, #30 and #25 pounders will do just fine. Heck, even a #20 will still do well. If possible, I would only make sure that the bow comes from a respectable recurve bow manufcturers – a comprehensive (though not all-inclusive) list is available here. How About 35 And 40 pounders? You can obviously still target practice with those and easily hit targets from well over 80 yards if you have the eye and concentration for it. While a 35# might be suitable for hunting in some conditions, I would advise against it – the reason being that these bows will often times not deliver enough kinetic energy to pierce the flesh of your pray, particularly if shooting from a distance greater than 15-20 yards. Because of that, if you plan to do some hunting, I’d strongly recommend going for a 40# draw weight or more. For more information on this subject, please check out my short but comprehensive guide: which draw weight should you choose. It’s also worth remembering that in certain States and counties, it’s illegal to hunt with a recurve bow that has a draw weight of less than 40 lbs. Unfortunately I do not have an exact list of these states, and things could have changed a little over the years, so what I recommend is getting in touch with any Archer’s federation or even an Archery range located close to where you plan to hunt – they will definitely know what laws apply in that particular part of the country. Regarding hunting, a 40 pound recurve bow can be successfully used to hunt wild turkey and deer. However, if plan to specialize in hunting larger game (elk for example), then I would recommend getting a #45 (or heavier) bow for optimal performance, simply because it will help you feel more confident no matter your distance from the prey. 45 lbs. And Higher Draw Weight? These can be used for pretty much anything, be it hunting or target practice. 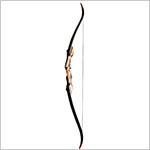 You’ll never feel restrained, and if anything – it is you who will need to try and keep up with the capabilities of a quality 45#+ recurve bow. As you can see, this list is longest – that’s because these type of recurves provide the most versatile capabilities, so there is a huge demand for them. Although I do not know of any recurve bows with this kind of draw weight and which would be available for sale nowadays, I thought it would be interesting to mention that, historically, this kind of draw weight was very often used – particularly in the English longbow which was extremely popular during the middle-ages. In fact, the English Longbow had to be a minimum of 110 lbs. to be deemed suitable for combat, and the strongest Archers would even carry 130+ lbs. bows. You can imagine just how much effort these took to shoot, but also how devastating they must have been. History teaches us that these bows were well capable of deeply piercing a human being from as far as 235 yards! So which draw weight should you choose? This two sources will make it more than clear to you which draw weight you should go for. Once you know, feel free to use the various comparison charts and reviews available on this website to choose the recurve bow most appropriate for your needs. How Much Draw Weight Should You Get? Hi there – I love your site! Hugely informative I got in to archery last year and was wondering if you could help me regarding draw weights. I can pull 27″ with my 60″ takedown recurve (old style due to preference). My bow says 40lbs as the draw weight, but I was wondering if this weight applied to a 24/25″ draw? If so, what could I expect to receive with a 27″ draw and how much does the weight increase with each extra inch of draw? Michael, AMO standards for listing draw weights are to list the weight of a bow when drawn to 28″. A traditional style bow will gain or lose 2 1/2- 3 Lbs. per inch of draw length. For example, a bow listed at 40Lbs (28″). would draw approximately 42 1/2-43Lbs. at 29″. 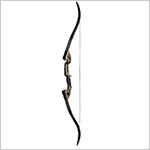 This same bow will draw approximately 32 1/2 Lbs at 25″ draw length. I hope this helps. What’s the degree a bowman would need to elevate his bow arm, to send a heavy ceader shaft with a bodkin tip across a battlefield to his target with the wind speeds fluctuating between 25 and 30mph and the target is a little over 200 yards in chain and gambeson? The draw weight of the bow is 120lb. With a draw length of about 28 to 33 inches (overdraw). You are slightly less elevated than the opposition giving you an obstructed view of the lands lay out. I have a PSE Snake recurve bow how far is the accuracy of the bow. Just found your website, and this is a great resource for the performance capabilities of different recurve weights! My daily shooter is an old Ben Pearson Golden Regent that draws 35# @ 28″ and is a real tack driver. My only comment that I hope you’ll find useful, having been part of a medieval living history organization for the past 12 years, is that there’s new evidence which indicates the average weight on the English longbow is actually lower than we all previously thought. I was surprised myself, but recent examination of historical examples (especially those salvaged from the wreck of the Mary Rose) indicates that the average weight was in the 80-90# range, still more than capable of piercing mail and certainly the padded linen coat (gambeson) worn by most ordinary soldiers. As an aside, recent theories also suggest that the heavy use of the bodkin point over the broadhead has led to do with armor penetration and more to do with the fact that the elongated “square nail” shape of the bodkin can be produced in quantity faster and by less-skilled smiths than the broadhead. Hope you find this interesting, and I’ll definitely be returning to your site for information! So I bought a 45 lb draw weight recurve PSE. I’m wondering if it will support a 28 inch arrow. I think the 26 inch is too small for me. I’m 6 foot with about a 4 maybe 5 ft arm length. (One hand to the other) Can you give any advice on this?